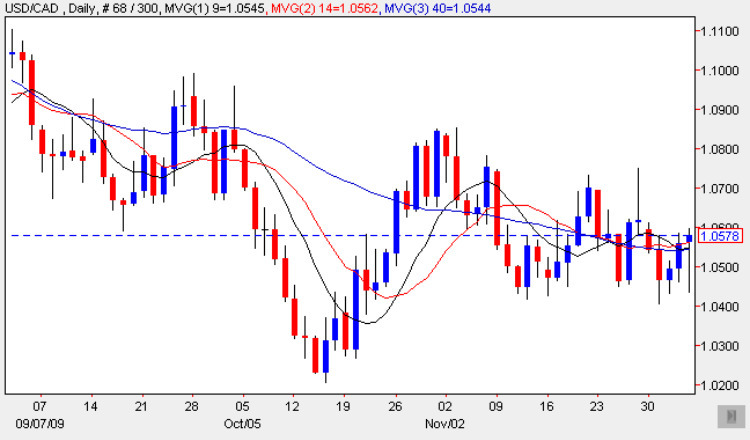 The usd to cad continued to bounce around on the 1.05 price region, with counterbalancing signals between last Friday and that of a week earlier, with the first suggesting a fall based on the shooting star candle ( which arrived but failed to develop) followed by this weeks candle which closed on Friday with a narrow body but a deep lower shadow, suggesting that the bulls are temporarily back in charge of the usd to cad market! With the currency pair now apparently finding some traction at the 1.04 price level, we may well see a continuation of this upwards momentum in the early part of the week for the usd to cad pair, but for this to be sustained, it will have to be coupled with a break and hold above the 1.11 price handle which is some way above the current price action at present, and in the short term the first target on the horizon is the minor resistance in the 1.08 price region, and until we see a sustained push above these level, then a further period of sideways consolidation seems likely in the short term. The only item of fundamental news due for release today for Canada is the Building Permits data which is expected to come in 1.1% as opposed to the 1.6% previous figure. Building Permits measures the change in the total value of new building permits issued and is considered an important indicator of future construction activity. Meanwhile in the US we have a speech from Bernanke as well as the consumer credit data – details of which can be found on the eurodollar site.